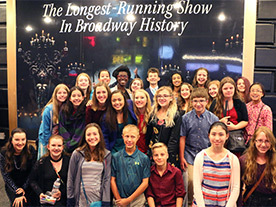 Chandler Children’s Choir offers a progressive tour program for its three choirs. We expect all singers to participate as members of CCC. Touring fosters growth as a choir, raises the level of performing together, and encourages independence. Touring also provides the opportunity for new audiences to hear our choir. We encourage you to look through photos from previous years' tours to get a taste of what our touring program is all about! CCC’s 2019 tour schedule includes unique opportunities for each choir. We have designed the Junior Tour Program to introduce the singers and their families to the concept of going on tour, in preparation for the larger, more complex tours they will encounter as they promote up though Encore and Cantus. We have designed the Encore Tour Program to allow singers and their families to experience all aspects of touring, from fundraising to being away from home and participating in arts enhancement programs. We have designed the Cantus Tour Program to increase choir members’ skill levels and performances together in ways that cannot be accomplished within the confines of rehearsal time. Singers will also participate in amazing performing opportunities, experience the arts from different world views, find art in its many forms beyond choral music, and expand boundaries outside local influences.